Black Ops 2 PC and PS3 gamers patiently waiting for the arrival of the new Black Ops 2 Uprising DLC will be pleased to learn that the latest DLC has now arrived on both PC and PS3 systems. Watch the trailer for the new Black Ops 2 Uprising DLC after the jump to get a glimpse of what you can expect. 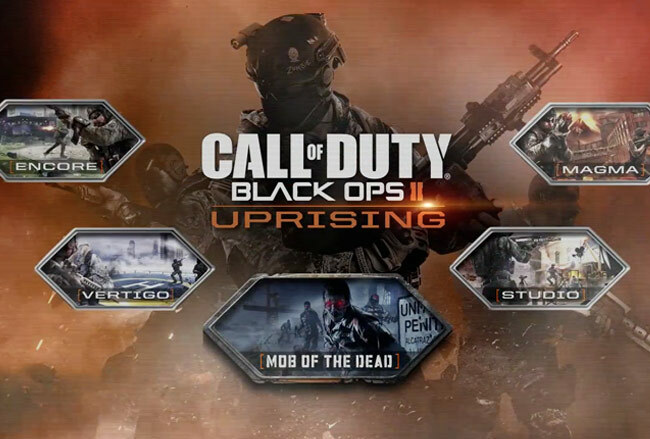 The Black Ops 2 Uprising DLC adds the Magma, Encore, Vertigo, and Studio multiplayer maps to the mix, with the latter being a reworking of the classic ‘Firing Range’ level featured in the original Black Ops. Together with Mob of the Dead, a Prohibition-era Zombies mode map that takes place at Alcatraz Prison. Enjoy! – Magma – Set within a modern Japanese village, volcanic eruptions carve multiple paths throughout the town. – Encore – Taking place in the aftermath of a deserted London music festival, Encore leaves numerous opportunities for run-and-gun, close quarters combat. – Vertigo – A futuristic high-rise mega-structure located in India featuring dizzying vistas and multi-tiered pathways. – Studio – A contemporary re-imagining of “Firing Range,” the fan-favorite multiplayer map from the original Call of Duty: Black Ops. “Studio” is a Hollywood movie back lot with a variety of cinematic themes that range from Sci-Fi to the Old West.